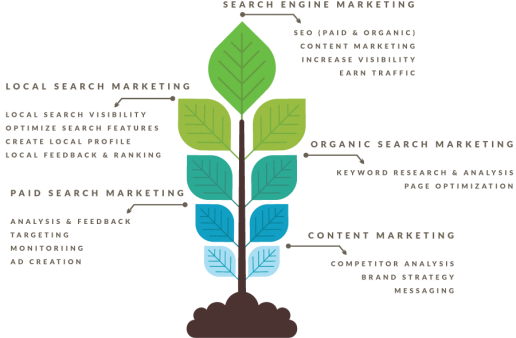 Developing an organic search marketing strategy is a low cost solution that will allow your company to grow its online presence gradually. The end goal? To increase the volume of qualified traffic to your site. SEO will improve your website’s ranking on all search engines. Capture your potential customers during their research and purchase journey with targeted ads, ad optimization, monitoring, analysis and feedback. Implementing paid search marketing as a component of your inbound program will help ensure your marketing strategy captures your future customers at the right point in their buying cycle. Local business? Your customers need to find you. Our team will grow and sustain your business’s local presence online by evaluating your current local search visibility, optimizing search features, creating your local search marketing profile, submitting updated information to local search directories and maintaining online ratings and business feedback. Create and edit your company information, maximize visibility in online business directories and push your listings to data aggregators. End result? Search engines can access your local information and your customers will find you!